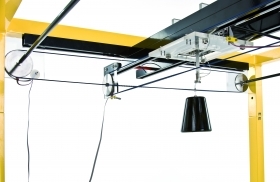 The three-dimensional model of industrial crane is a highly nonlinear MIMO system equipped with a dedicated system of sensors unique 2D angle measuring unit. The system is fully integrated with MATLAB/Simulink and operates in real-time. The software enables rapid prototyping of real-time control algorithms. The C-code writing is not required. 3D Crane is delivered with the library of basic controllers. The model has three control DC motors and five position measuring wheel encoders. An example of the 3D P controller is shown. The Real Time Workshop and Build Model items chosen from the pull-down menus execute the RTW routines. As a result one obtains the executable file which operates as a real-time controller after connecting it to Windows Target.